What a weekend! As you may have heard, DCI had a little get-together this past weekend down in Orlando, Fla. Boston Crusaders trumpet player Harry Freeman and myself were both invited to speak in front of the Tour Event Partners as a part of this whole shindig. Additionally, we were welcome to participate in any part of the weekend's proceedings. When I mean any part, I mean any part. Friday night, I won the eight-player No Limit, Texas Hold 'em poker tournament hosted by DCI Contest Coordinator Tony Dicarlo. This was to the amusement of everyone who stopped by to watch the action, including my corps director Pat Seidling who warned me about "running with the big dogs." Of course, I have to thank Capital Regiment program coordinator Wayne Dillon and percussion caption head Kevin Murphy for cheering me on to victory. There's your shameless plug Wayne, are you happy now? The best part of the entire weekend was the way that Harry and myself were received by everyone there. Even though we were marching members in a sea of instructors, coordinators, judges, and administrators, we were treated with the same respect as everyone else around. People had no problem having a conversation with us, and, to at least my surprise, they actually valued our opinions! Now I'll admit, I definitely had more than a few "starstruck" moments. But hey, it's not too often that I get to meet Gino Cipriani, Wayne Downey, Marc Sylvester and Brandt Crocker all within a span of five minutes! And even though they're all affiliated with Phantom Regiment, it was still impressive to sit down and have dinner with JD Shaw, Paul Rennick, Jamey Thompson and Adam Sage. I learned a whole lot this weekend about the other side of this crazy thing called drum corps. It's amazing to see how much work and planning goes on "behind the scenes." It really interested me to see just how different the other side of this world is. Yes, it's still drum corps, but it really has nothing to do with playing a note, or marching a dot. There are a lot of things that we members take for granted. After all, we just get off a bus and march a show -- we don't worry about how all of the corps are going to get there, what order they'll perform, who will judge them, how much anyone will get paid, or anything else. We just do our thing and head on down the road. Of course, no weekend would be complete without something completely out of the ordinary. While driving around with Revolution's brass caption head Roger Williams, we spotted what we like to call the "sign of the apocalypse." 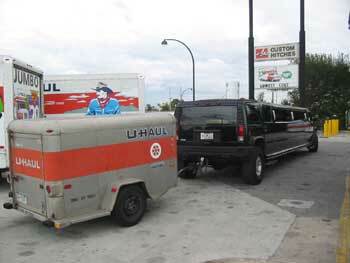 As you can clearly see, that is a stretch Hummer limo -- towing a U-Haul!